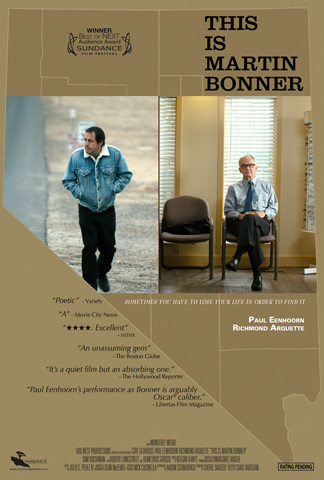 I've seen a number of great independent films this year, few better than Chad Hartigan's exceptional, wise-beyond-its-years This Is Martin Bonner. A younger man's view of middle-age that is neither condescending nor bemused, recognizing old age is not be as alien as we might think while also acknowledging that one's worries and preoccupations do shift. It's a beautiful, lived-in movie, matching the older age of its leads with a sedate style that eschews the Dardennes-aping handheld cameras and blotchy sub-impressionism that seem to be so popular at Sundance. It's just good storytelling on a written, visual and acted level, and one of the best of the year's first half. Read my review over at Movie Mezzanine. Check out my latest Netflix picks over at Movie Mezzanine. Belatedly putting up last week's Netflix picks. Check 'em out here. UPDATE: The piece that I wrote here was republished by Film.com, where you can now find a slightly amended version (basically, less references to myself). I'm thrilled to have it posted there and I hope you'll be seeing my byline there more regularly soon. My Gandolfini tribute can be found here. Slightly too focused on Jeremy Scahill himself as the journalist uncovers a massive, unsettling method of covert operations, Dirty Wars nevertheless condenses years of Scahill's arduous reporting legwork into a concise, dramatic thriller that blanches at military overreach as much as it respects the fading art of honest journalism. It provides food for thought for supporters and detractors of the Obama administration, clarifying their response to the War on Terror not as a push toward peace (or a retreat) but an advance of warfare in clandestine terms that should make everyone take pause. Scahill's empathetic facial reactions to horrific stories from interview subjects may be overused, but it's hard not to cheer a journalist so steadfastly doing his job, and as instructive as the film is for uncovering a terrifying military expansion, it is equally instructive in showing the process by which such a thing is credibly pieced together by a diligent reporter. I was not particularly taken with Omirbayev's Student, a wan retelling of Dostoevsky's Crime and Punishment that reduces the complexities of the prose and its philosophical annihilation and desperate search for grace into a set of thin, anti-capitalist signifiers. Bresson already showed people how to adapt this novel with a spare style, but the chaotic tone underneath appears nowhere in Omirbayev's tidy bore. Check out this week's Netflix Instant Picks over at Movie Mezzanine. To the Wonder marks the fullest distillation of Terrence Malick’s style even as it violently shakes up the formula like nothing else in his oeuvre from the start. Its opening shots roll out under a blanket of digital snow, lending an immediacy to its central couple’s passionately begun relationship even as it buries some of the romance under heavy image artifacts. Later, back on pristine 35mm stock, Malick and Emmanuel Lubezki bring the same loving aesthetic care to shots of a Sonic Drive-In and a nondescript supermarket that they do to shots of nature. The mundane began to creep into Malick’s frame with The Tree of Life, but even the routines of suburban life were elevated through its overwhelmed child’s perspective, to say nothing of the link of the concrete and uninspiring to the cosmic and ineffable. To the Wonder, however, situates itself firmly within the banality of life, even if the film itself gives over completely to Malick’s cinema of gesture, collage and hushed narration. 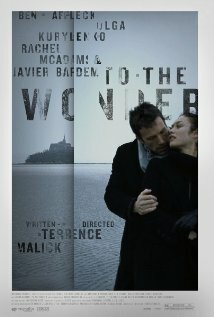 The wonder of the title refers to the Merveille of Mont Saint-Michel, the abbey off the coast of Normandy where American Neil (Ben Affleck) and Frenchwoman Marina (Olga Kurylenko) travel after meeting on the former’s European trip. They reach this location not five minutes into the movie, fulfilling the epic ambition of the title through a punny loophole. Where Tree of Life culminated on a beach that elevated reality into the sublime, To the Wonder begins on one, forcing the characters to spend the rest of the film returning to the world. The results make for perhaps Malick’s most harrowing picture, despite laying claim to a corpus in which four of six films contain murder, if not outright war. Violence, pestilence, devastation have always had a place in Malick’s world; Tree of Life even indirectly traced the explosions of The Thin Red Line to a natural history of chaotic destruction and renovation via its intense creation sequence. But To the Wonder rips apart the personal bonds that gives the director’s work its intimacy, pushing farther than the familial strife that tore open holes in his last film and removing (almost) entirely the notes of loving reconciliation and restabilization. Check out this week's Netflix picks at Movie Mezzanine. One of these days I hope to write a more in-depth appreciation of this film, as well as Jack Black's exemplary performance in it. For now, the piece I wrote for Movie Mezzanine is more of a general recommendation, a reminder of this small but poignant delight to go with the limited release of Before Midnight, which I am waiting for with bated breath. In retrospect, Linklater nails the budding youth of Generation Y with the same observant and honest eye with which he charts Generation X, and I hope he does more movies about millennials in the future. I had such an unexpectedly good time at the most recent Fast and Furious movie, despite some reservations about its overbearing plotting, that I took advantage of some sales to acquire the previous films, three of which I had not seen, and marathoned through them over the last couple of days. Of the ones I'd not previously watched, the best was this third film, an aberration in the franchise that suddenly introduced a whole new cast to go with a whole new location and, most importantly, a whole new style of racing. Justin Lin's first foray into the series falls into the same pitfalls of the earlier movies (the self-parody of its neon underworlds, a diverse set of faces placed under the whitest man the casting people could find), but he charges the series with new energy, meshing his style with the racing like not even Singleton did and making a case for this franchise as one of the most shamelessly giddy in a Hollywood increasingly defined by dour, self-serious blockbusters. It's not great cinema, but it's often damned delightful, and I'll revisit it as much as the last two installments.